Oct. 14, 2015, 12:44 p.m.
CNN broadcast the debate in virtual reality — if you could stand the heat of your headset. By Joseph Lichterman @ylichterman Oct. 14, 2015, 12:44 p.m.
Last night’s Democratic debate set viewership records: more than 15 million people tuned in on CNN, and at one point there were 980,000 concurrent live streams on the network’s website. But beyond the cable and online viewership, there was another audience CNN was courting: the lucky few who own a Samsung Gear VR headset. Using four virtual reality cameras throughout the debate hall, viewers watching on the virtual reality stream could feel like they were in the room with Jim Webb as he smirked about the time he killed an enemy soldier in Vietnam. The Washington Post also used the debate to experiment with VR, producing a 360-degree tour of the post-debate spin room. While the VR audience was certainly small — the Samsung headset is only available now in an “Innovator Edition,” with a cheaper $99 model coming out next month — CNN viewed it as an opportunity to experiment with a new technology that could be a substantial part of news in the future. Presidential campaigns and elections have long been opportunities for news organizations to try out new coverage methods (remember will.i.am’s appearance on CNN in 2008 via hologram?) because even though it’s a major event, it’s one with months of lead time for preparation and testing. So what was it like actually watching the debate on VR? I’m also kind of lonely. I can faintly hear my coworkers cracking jokes in the background, and I already miss my Twitter feed. There’s no interactivity on this thing, although it would be cool if they eventually added it. 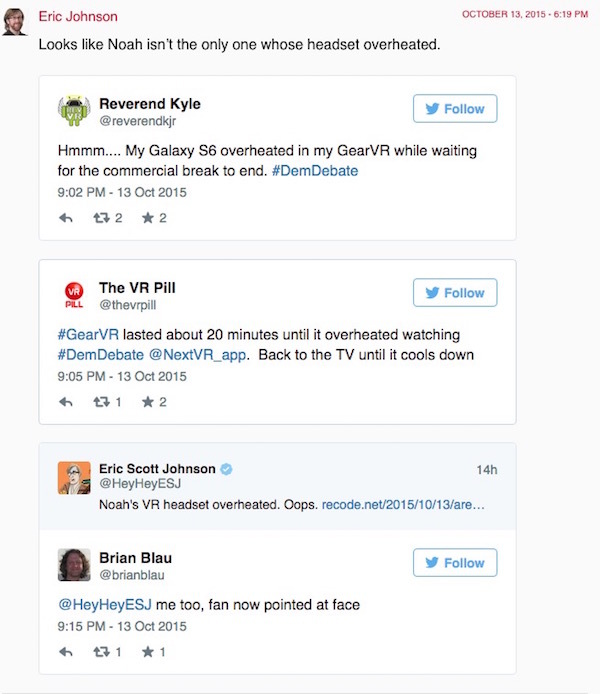 Recode liveblogged its experience watching the debate in VR. They ultimately cut out a half-hour early after none of the reporters wanted to put the headset back on because…it kept overheating. This, apparently, was a common experience. When CNN’s average TV viewers saw Clinton’s pearl earrings, all I saw was a blonde-haired blob on stage in a blue pantsuit. And when everyone else was watching Sanders sporting those 1970s-chic glasses, what I saw was an old white guy in a suit who appeared mildly fond of moving his hands. And the audience? Forget about them. Individual reactions to the debate were completely impossible to read. So while the candidates and the audience were mostly indistinguishable on stage, several huge CNN logos were always in sight. I counted nine in one shot. Fans of the network’s Anderson Cooper had something to be happy about. Besides his cameramen, who appeared below me a few times, Cooper was as close as you got to seeing a human up close in virtual reality and that was still from about 15 feet away. Stephen Colbert seemed to agree. Earlier this month, he watched a replay of the Republican debate in VR, but, using the magic of television and virtual reality, he decided to ultimately leave the debate, go to a bar, and fly off on his dragon after getting into a fight with a police officer. POSTED Oct. 14, 2015, 12:44 p.m.
Lichterman, Joseph. 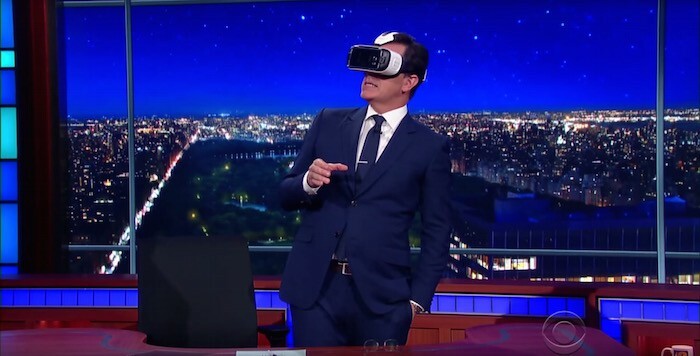 "What was it like watching a VR stream of last night’s Democratic debate? Hot and heavy." Nieman Journalism Lab. Nieman Foundation for Journalism at Harvard, 14 Oct. 2015. Web. 18 Apr. 2019. Lichterman, Joseph. "What was it like watching a VR stream of last night’s Democratic debate? Hot and heavy." Nieman Journalism Lab. Last modified October 14, 2015. Accessed April 18, 2019. https://www.niemanlab.org/2015/10/what-was-it-like-watching-a-vr-stream-of-last-nights-democratic-debate-hot-and-heavy/.